I am very proud of the precision and amount of detail in this lesson and its designed to be engaging and to ensure students make measurable progress. The class begin by exploring an odd one out exercise for the starter activity and this draws their attention to early Chinese views of westerners. 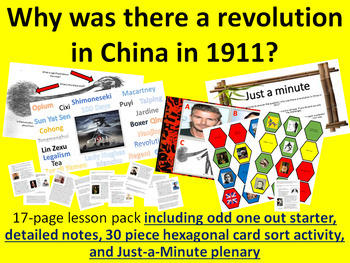 This then leads into an extremely detailed set of notes (which I created when teaching in China) before students attempt a 30 piece hexagonal card sort which is colour-coded into factors. The class then make links and explain the Key Question before finishing with a fun 'Just-a-Minute' plenary in order to test their understanding and knowledge gained. I hope you enjoy this lesson as much as my students do. It acts as a great way to end a unit on Qing China or to begin one on C20th China.